Plants the essential part of our lives that provide us food to live on. The scientist has been researching for many years that how we can survive on space. Is any life possible in other planets too? For this matter of concern, a scientist comes across a conclusion that how plants grow. Is it can grow without soil. There are many things plants need to survive like all other species on earth. These include Water, temperature, nutrients, space, air, and soil. In which nutrients contain nitrogen, It is a major component of chlorophyll. The compound by which plants use sunlight energy to produce sugars from water and carbon dioxide which is called Photosynthesis. They get nitrogen from water and from the soil. Recent research has looked into how plants respond to low levels of gravity and a particular hormone which can help plants grow in challenging space conditions. They are succeeded to grow a plant with an artificial soil made by Lava Rock. Picture credit: Silje Wolff, NTNU Social Research (CIRIS). The theme of this research is to grow a plant without the need of soil. All the nutrients for plants to grow can supply only by water instead of soil. We know that in space soil cannot be supplied, it relies on earth. How do the plants grow by water only? The high technology planters are made to grow the plants without soil. These planters are made by NTNU’s technical workshop and tested by CIRIS. Planters regulate water, nutrients, gas, and air which is neccesary for growth in plants.Team of Researchres has been investigating how plants use nitrogen in particular and how the levels of nutrients available affect the amount of water that the plants consume. They found that plants can smell’ the amount of nutrients available to them,. When the nitrogen concentration is very low, the plant will absorb more water and thus more nitrogen until it reaches an optimal level. The plant has a mechanism that turns on when the nitrogen level is adequate. Then it adjusts both nitrogen and water absorption down. This is the way to get plant nutrients but other challenge is plants needs gravity for mechanisms to grow. Growing plants in space is another challenge for the researchers. The solution for this is to place plants into a Centrifuge. It is a machine using centrifugal force for separating substances of different densities, for removing moisture, or for simulating gravitational effects.This stimulates gravity which the plants sprout and grow. 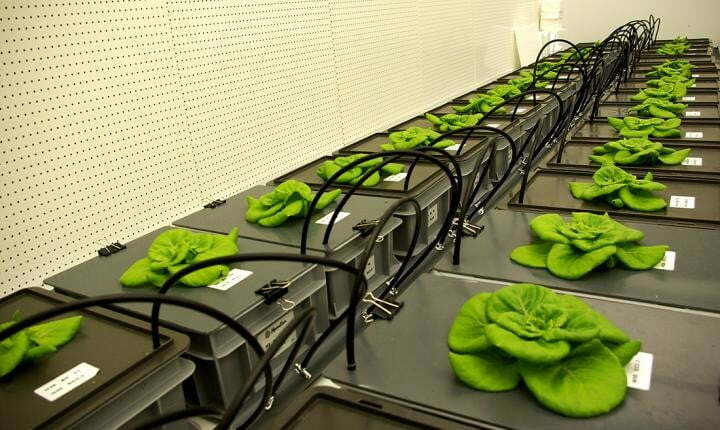 This technique will helpful not only in space but also at the earth where the soil has poor nutrient capacity and for the places where much amount of soil is not available. This will make plants grow directly from water.